Lets start with a history lesson. For those of you unaware of who Al B. Damned is, he was the lead singer of The Texas Drag Queen Massacre before embarking on a solo career under his Al B. Damned moniker. While comparisons to Wednesday 13 are inevitable, many are unfounded. They do have similar vocal styles and share the beloved genre of horror based music, but that is where the comparisons should end. Unfortunately for fans of Mr. Damned, as of this writing this is his last solo album. Not to say he is leaving music, as he has started a new metal band called Beneath Dead Waves. But enough about the mans history, lets focus on this particular release. The EP starts off with Scream Bloody Murder. The song kicks the album off with a bang, getting the vibe right out there for the uninitiated. We then move onto the official single B-Movie Monster which is quite obviously a fun song about love for several B-movies from the past. While name dropping Godzilla, Mothra and the mighty Kong the song is just a bunch of fun for anyone who grew up loving these monsters. Up next is Skin Deep. It takes the tempo down a bit and is a bit more reserved, but not when it comes to the lyrics. Think of it as a demented love story ala The Loved Ones. Innocent Blood is your typical tune about shedding blood and the deadly sins. Killing Myself For You brings the tempo back up and is all about the problems one can face in a relationship. Next we come to my personal favorite song on the EP, Carrie. If you haven’t gathered, yes, it is about Stephen King’s telekinetic outcast teen. It really amounts to a love song to the titular character while covering many of the plot points of the story. Finally the album comes to an end with I Just Wanna Be Me which could easily be an anthem for any horrorpunk, or outcast for that matter. When the album first came out it wasn’t a song that I paid a lot of attention to, but it has slowly become one of my favorite songs, not only on this album, but on any album. Overall, the EP is definitely a hit. My only real complaint is that, being only seven songs, it is far too short. There have definitely been many times that I immediately restart the album as soon as it is finished. Seeing as this was Al B. Damned’s last release for the time being (I am personally hoping he will one day come back to the project) he was kind enough to make the full EP available free to download on his website. 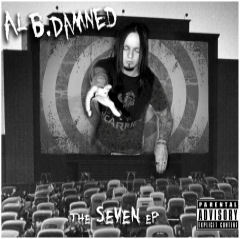 So if you haven’t heard it yet, get over to AlBDamned.com to check it out.